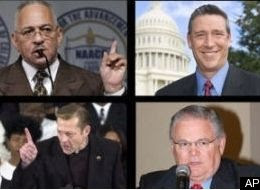 Well, if this march to the White House is doing anything- other than possibly leading to the electing of an African American or woman President for the first time ever, it’s certainly outing preachers as big time a-holes. This Hagee guy is ridiculous- check out his YOUTUBE videos, Hitler’s name wasn’t bandied around this much the night they planned Krystallnacht. And Jeremiah Wright, Obama wishes he talked about Hilter. More recently these loonies- Rev. Rod Parsley, who thinks Christianity’s purpose is to destroy Islam and this dude- the Rev. Pfleger who you can see preaching here at either Chicago’s Trinity Church, or Our Lady Queen of Martin Lawrence- these nuts have come out of the woodwork to make McCain and Obama’s life miserable. 1) Does he talking about Hitler a lot- and when he does, is it not always within a negative context? 2) Does he think AIDS was made by our government, who by the way, can’t consistently pave roads, in order to eliminate a race of people? 3) Does he perform like this, when at the pulpit? If you’ve answered “yes” to one, or a few of these questions, then your preacher may in fact be an a-hole. I know this may come as a shock to you- let’s face it, no one wants to hear so many bad things about a person whom they've invested so much money in, but alas it could be true.